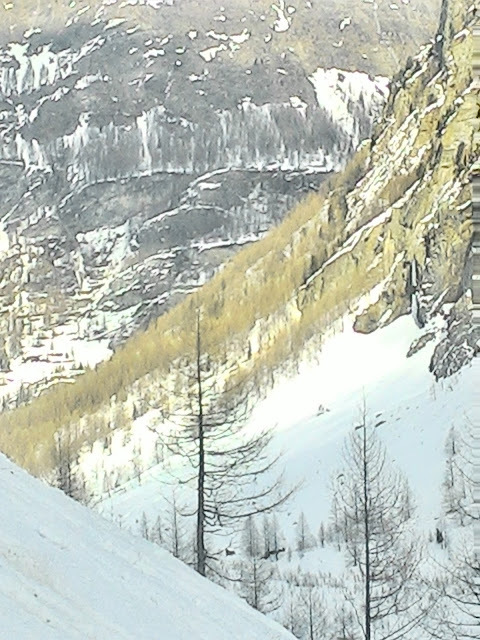 Last week in Cogne, 21. February 2018, a young Italian ice climber died when the detached pillar on the climb of Pattinaggio Artistico Diretta broke off while he was climbing it. I was walking into the Valeille side valley from Lillaz near Cogne the day of the accident to climb something else. The column broke off on the right side of the fall where you see the obvious fracture line. I had seen the formed pillar earlier in the week and it looked okay, a bit smaller in diameter at the base than at it's attachment point and not as massive looking as when I last saw it well formed about three or four seasons ago. The above photo is the larger of two pieces of the broken pillar about 250 meters below the icefall. I do not know any exact details of exactly what happened such as whether or not the climber had placed ice screws in the column or not. There was a report in Italian in the local mountain rescue website for the Aosta valley that said there was a three-person rope team led by the accident victim who may have been in the role, or was, a mountain guide. The second piece of the pillar resting further up slope from the first and just a bit smaller. Both chunks of ice are massive weighing hundreds of kilograms each. The site www.icefall-data.org outlines the accident with temperature information here. There has also been some back and forth on icefall-data's Facebook page about the comments written into the ice conditions books in Bar Licone and the ice conditions website from Hotel La Barme in Valnontey. 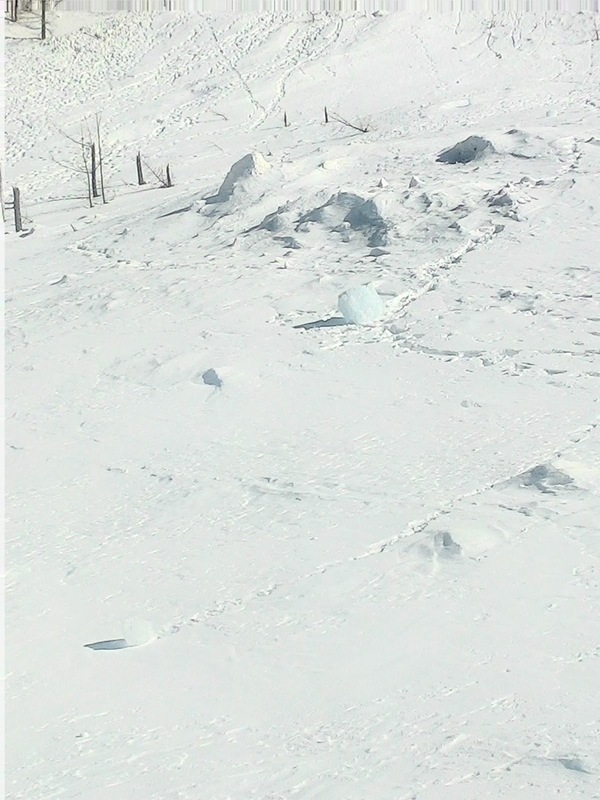 Above, the rescue helicopter set down on the snow slope 100 meters from the ruptured column that had been embedded in the rock walls of Pattinaggio Artistico Diretta. On the 17th and 18th of February there was a major warm front that moved through the west Alps pushing the snow level up to 2000 meters and the freezing level to 2200 meters. There was very heavy precipitation, which fell as rain on the majority of ice climbs in Valeille including Pattinaggio Artistico Diretta. In the couple of days prior to the accident, temperatures swung in the other direction getting to around -10 to -12 degrees centigrade at night. The air temperature difference was easily as much as 15 degrees within a 48 hour period. Additionally, climbs on the left side of Valeille (the side of Pattinaggio Artistico Diretta) come into the sun in the afternoon and receive the effects of very strong solar radiation. In the first photo that starts this post, one can see the deep blue color of the ice. 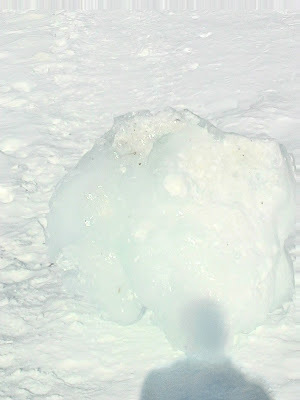 This indicates very compact ice that has been warmed by solar radiation during the later part of the day. (At the time of the photo it was probably +2 or +3 degrees centigrade.) The ice becomes infused with melt water that then (hopefully) refreezes in the night, the ice structure expands as the water turns solid. This process is fickle as extreme fluctuations in temperature, humidity, sun, etc., will cause instability and when the fluctuation is shifting towards drastically colder temperatures, the ice is full of tension. 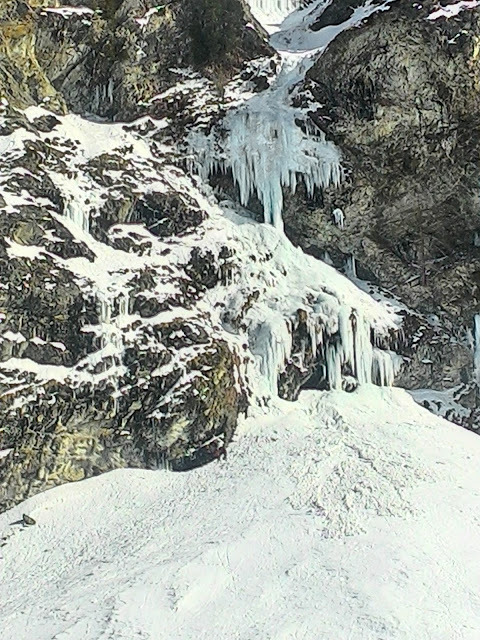 This is a photo of the classic WI5 icefall Stella Artice a couple hundred meters further in the valley, and on the same side, as Pattinaggio Artistico Diretta. The photo was taken two days before the accident. What do you think of the ice structure and conditions of this climb? The ice season in Cogne usually goes from mid-December through March. Stella Artice was photographed above at the end of February. 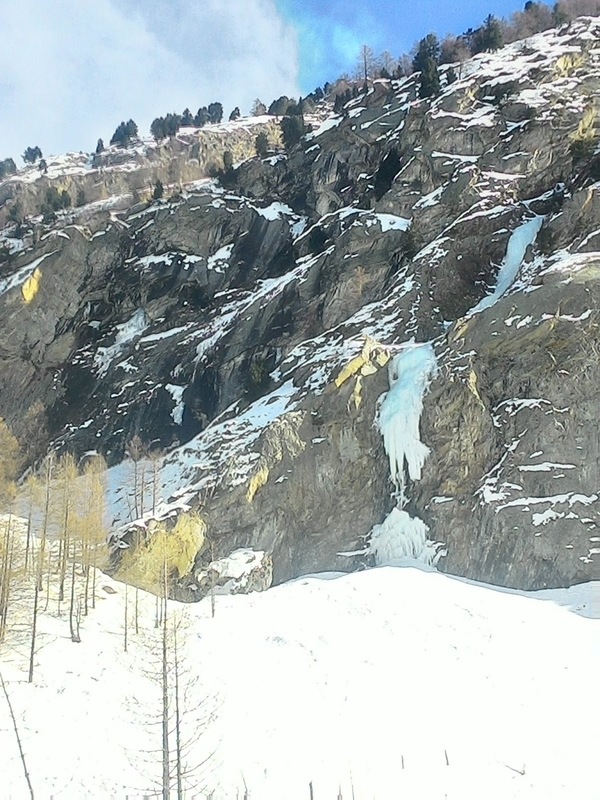 However, the conditions show an icefall in a state of typical early season ice. There are large hanging massive icicles, the pillars that touch down are much smaller at their base than at their attachment points and the difficulty of the icefall is clearly much harder than WI5. Additionally, if you have seen this icefall in good conditions, you can easily evaluate the difference between the February 2018 structure of Stella Artice and how the icefall looks when it forms in a much better and fatter way. 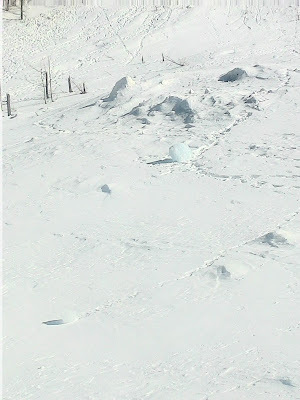 The take-away from all the above is that the ice in the 2018 season in Cogne is much more sensitive to the weather and other environmental factors as the season comes to a close because the ice structures, most notably at the beginning of the side valleys and under 2000 meters, are much more susceptible to the sun and temperature because they are more or less in early season conditions, far from 'fat' and far from massively stable. In the condition reports in the notebooks in Bar Licone or Hotel La Barme there are multiple descriptions of "very good conditions". There is a little bit of self-inflationary reporting as some climbers do not want to say that a grade WI4 or WI5 icefall is harder than the guidebook grade or that they are somehow challenged at this level. But, a lot of climbs that are noted as being in good conditions are clearly not when viewed from the experience of the perspective of over a period of ten years. What someone else writes in a notebook or on-line is just their opinion, which they are clearly entitled to, however it is just one bit of information from one human being who we usually have no contact or knowledge of. Ueli Steck was asked how he decides to climb something, if he calls hut guardians for information or talks to mountain guides, etc. He said "No", he makes is evaluations with all the information he collects and what his personal observations are. His point was that he did not want to be influenced, one way or another, from outside people with their own set of judgements, experiences and personality make up. Further, he felt that he has the experience to make his own decisions. He also needs the quiet, inner, reflective state of mind to really evaluate exactly what he is feeling, sensing and interpreting.